Daniel Lemire's blog – Page 3 – Daniel Lemire is a computer science professor at the University of Quebec (TELUQ) in Montreal. His research is focused on software performance and data engineering. He is a techno-optimist. It is true that major breakthroughs are typically connected to young individual’s name, but that’s not because the older folks are not creative, but because the young people are trying more often. That is that the productivity in youth is higher, and with age productivity drops down. People are simply not trying to build new companies, not trying to write new research papers, not trying to paint new paintings, and when we correct for the core productivity, it turns out that innovation has no age. In other terms, as long as we keep trying and putting projects on the table, your chances of breaking through at 80, is exactly the same as breaking through in your twenties. Previous success + fitness = future success. The book is well written and I recommend it. We know that naked mole rats essentially do not age in the way most mammals do: their mortality does not increase with age as far as we can tell. We do not know why that is. Munro et al. argue that it might due to their mitonchondria (the power plants of our cells) that seem remarkably resilient and well protected. Intense exercise might improve your protein maintenance via short-lived hormonal changes. In Can Medicine Be Cured?, O’Mahony points out that medical research is failing patients. Work done in laboratories fails to translate into better health. When there is translation in the clinic, it is often costly and incremental. Large investments translate into mediocre gains. The book rambles on about gluten intolerance but is otherwise excellent. A case can be made based on this book that medical research is overfunded: in computer science, we receive a tiny fraction of what the medical researchers receive, but we seem to have a much greater impact on society. I am unsure why medical research is so unproductive, but it seems obvious that the incentives to improve clinical outcomes are too small. The focus seems to be on writing research articles. Research articles are a means of communication, not the final outcome of a research project. There is a clinical trial aiming to use gene therapy (via a virus) to cure and prevent macular degeneration, a disease that lead many older people to become blind. The surface of Mars is probably too harsh for even bacteria, that is, it is likely maintained sterile. An Israeli company just launched a craft called Beresheet at the Moon, at the modest cost of $100 million. They used Elon Musk’s SpaceX services. Right now, the only resident on the Moon is a Chinese robot that landed last Month. In software, compilers can often optimize away integer divisions, and replace them with cheaper instructions, especially when the divisor is a constant. 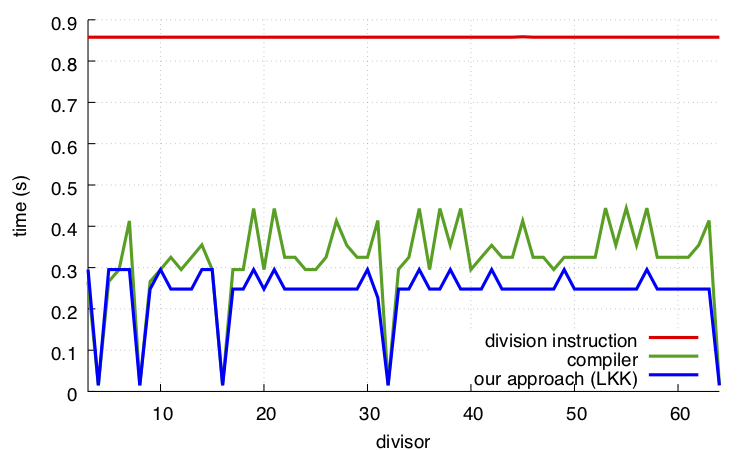 I recently wrote about some work on faster remainders when the divisor is a constant. I reported that it can be fruitful to compute the remainder directly, instead of first computing the quotient (as compilers are doing when the divisor is a constant). To get good results, we can use an important insight that is not documented anywhere at any length: we can use 64-bit processor instructions to do 32-bit arithmetic. This is fair game and compilers could use this insight, but they do not do it systematically. Using this trick alone is enough to get substantial gains in some instances, if the algorithmic issues are just right. So it is a bit complicated. Using 64-bit processor instructions for 32-bit arithmetic is sometimes useful. In addition, computing the remainder directly without first computing the quotient is sometimes useful. Let us collect a data point for fun and to motivate further work. Finally, you can compute the remainder “indirectly” (by first computing the quotient) but using 64-bit processor instructions. Depending on your exact platform, all three approaches (compiler, direct, indirect) could be a contender for best results. In fact, it is even possible that the division instruction could win out in some cases. For example, on ARM and POWER processors, the division instruction does beat some compilers. Where does this leave us? There is no silver bullet but a simple C function can beat a state-of-the-art optimizing compiler. 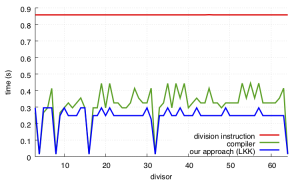 In many cases, we found that a direct computation of the 32-bit remainder using 64-bit instructions was best. In their new book Empty Planet, Bricker and Ibbitson argue that within the next 30 years, Earth’s population will start to rapidly decline. They believe that official population predictions overestimate future populations because they fail to fully take into account accelerating cultural changes. The doctors found that nine doses of the two pills over three weeks did seem to improve patients’ ability to walk a bit farther in the same amount of time, and several other measures of well-being. More trials will start this year. All five journals were listed as endorsing CONSORT, but all exhibited extensive breaches of this guidance, and most rejected correction letters documenting shortcomings. Readers are likely to be misled by this discrepancy. A new drug appears to reverse age-related memory loss, in mice. Soon after the first iPad Pro came out, I bought one and started using it daily. The experiment is ongoing and I thought it was time to reflect upon it further. Before I begin, I need to clarify my goals. When I started this experiment, some people objected that I could get a hybrid (laptop/tablet). That is definitively true, and it would be more “practical”. However, it would not be much of an experiment. I am deliberately trying to push the envelope, to do something that few do. So I am not trying to be “practical”. And, indeed, using an iPad Pro for work is still an oddity. Relying solely on an iPad Pro for serious work is even rarer. I am currently in Ottawa reviewing grant applications. There are a few dozens computer-science researchers (mostly professors) around me. The only other person with an iPad is a Facebook researcher, and he seems to be using the iPad only for reading applications, otherwise he appears to be using a laptop. In my department, other faculty members have iPad Pros, but I think only one of my colleagues use it seriously. Other colleagues do not appear to use these tablets for work when they have them. I am not sure. The main impact on my work at relying mostly on a tablet is that I am always focusing on one or two applications at a time. I recall finding it really cool, back in the days, when a Unix box would allow me to have 50 windows open at a time. I think having many windows open is akin to have many different physical files opened on your desk. It is distracting. For example, on a laptop, I would write this blog post while having an email window open, probably a couple of text editors with code. Yes, you can work in full screen mode with a laptop, and I try to do it, but I tend to unavoidably revert back to the having dozens of applications on my screen. Laptops just make it too convenient to do multiple things at once. If you need to concentrate on one thing for a long time, you really want to have just one clean window, and a tablet is great at that. On this note, it is also why I prefer to program in a text editor that has as few distractions as possible. I can write code just fine in Eclipse or Visual Studio, and for some tasks it is really the best setup, but it often leaves me distracted compared to when I work with single full-screen editor with just one file opened. Though I could not prove it, I feel that using a tablet makes me a better “reader”. Much of my work as a university professor and researcher involves reading and commenting on what other people are doing. The fact that I am entice to concentrate on one document, one task, at a time forces me to be more thorough, I think. As far as I can tell, programming seriously on a tablet like an IPad Pro is still not practical. However, there are decent ssh clients (I use Shelly) so that if you master Unix tools like vim, emacs, make, and the like, you can get some work done. I’d really want to push the experiment to the point where I no longer use a keyboard. That’s not possible at this time. I like the keyboard that Apple sells for the iPad Pro 2018. There is a major upside: the keyboard is entirely covered so it is not going to stop working because you spilled some coffee on it. Generally, most web applications work on a tablet, as you would expect. However, it is quite obvious that some of them were not properly tested. For example, I write research papers using a tool called Overleaf. However, I cannot make the shortcuts work. At the same time, it is really surprising how few problems I have. I think that the most common issues could be quickly fixed if web developers did a bit more testing on mobile devices. Evidently the fact that developers rely on laptops and desktops explains why things work better on laptops and desktops. At least on Apple’s ios, working with text is still unacceptably difficult at times. Pasting text without the accompanying formatting is a major challenge. Selecting large blocks of text is too hard. My final point is that working with an iPad is more fun than working with a laptop. I cannot tell exact why that is. I’d be really interested in exploring this “fun” angle further. Maybe it is simply because it is different, but it is maybe not so simple. My smartphone is “fun” even if it is old and familiar. A Canadian startup built around electric taxis failed. One of their core findings is that electric cars must be recharged several times a day, especially during the winter months. Evidently, the need to constantly recharge the cars increases the costs. I think that this need to constantly recharge cars challenges the view that once we have electric self-driving cars, we can just send our cars roaming the streets, looking for new passengers, at least in the cold of winter in Canada. If you are going to train computers to emulate medical doctors, you need objective assessments of medical conditions. That may prove more difficult than it sounds. Human experts rarely agree on medical diagnosis and therapies. How can you assess an artificial intelligence in these conditions? Somewhat ironically, the first step might be to learn to assess better the medical doctors themselves. This may not prove popular. Researchers are making progress toward reconstructing speech from neural patterns (Nature paper). The accuracy is still low but it is getting credible. One day, we may be able to speak through a brain implant. The US spy agency (NSA) is the largest single employer of mathematicians in the world? Neanderthals are often believed to have vanished because they could not hunt as efficiently as homo sapiens: they needed to get close to the prey to kill it unlike us. However, it seems that neanderthals could throw their spears far away. A highly cited Canadian medical researcher (Sophie Jamal) has been banned from getting further research funding in Canada because of how she fabricated data. When caught, she put the blame on her assistant. She is cited about 1000 times a year and she is the author of about 50 research articles. She lost her job at the University of Toronto where she was a professor and her medical license. She was the research director of the Centre for Osteoporosis & Bone Health. As I am fond of saying, it is almost trivial in research to fabricate results. Thus, while it is hard to know for sure how frequently results are just made up, it is probably more frequent than most people expect. And before you object that work is peer reviewed: when reviewing a manuscript, you are not going to redo the work to check that it works. Even if you wanted to check the work, it is often impossible to do it in an economical fashion. That’s why I argue that we have to take into account the reputation of the authors when reviewing a science paper. If you have found someone’s results to consistently be reliable in the past, it is reasonable to give them more credibility in the future. Reputation matters. Party balloons were invented by scientist Micheal Faraday. Following my recent blogging problems, the majority advice I received was to move to a different host. My blog is now hosted by SiteGround. Moving my content over was far easier than I anticipated, so far. I am no longer using Cloudflare to cache everything so your queries should hit directly my blog engine. In particular, this means that comments should work properly (comment and then see your comment). I will still rely on Cloudflare for performance, but hopefully not to keep the blog alive. You should also be able to comment on all posts, including older ones. Please report any problems.Going straight to production without further testing would be insane if I were running a business, but this is a non-profit blog. Several people offered to help out with the move. Given that it took me less than one hour, it made no sense to outsource that task. I spent the bulk of the time reverse engineering tiny settings. I also have several minor domains that I needed to move, and finding the content was the hard part. However, if I have further performance problems, I will seek help (either paid or unpaid). Thanks everyone! Web caching: what is the right time-to-live for cached pages? I have been having performance problems with my blog and this forced me to spend time digging into the issue. Some friends of mine advocate that I should just “pay someone” and they are no doubt right that it would be the economical and strategic choice. Sadly, though I am eager to pay for experts, I am also a nerd and I like to find out why things fail. My blog uses something called WordPress. It is a popular blog platform written in PHP. WordPress is fast enough for small sites, but the minute your site gets some serious traffic, it tends to struggle. To speed things up, I tried using a WordPress plugin called WP Super Cache. What the plugin does is to materialize pages as precomputed HTML. It should make sites super fast. There is a caveat to such plugins: by the time you blog is under so much stress that PHP scripts can’t run without crashing, no plugin is likely to save you. I also use an external service called Cloudflare. Cloudflare acts as a distinct cache, possibly serving pre-rendered pages to people worldwide. Cloudflare is what is keeping my blog alive right now. After I reported that by default (without forceful rules) Cloudflare did very little caching, a Cloudflare engineer got in touch. He told me that my pages were served to Cloudflare with a time-to-live delay of 3 seconds. That is, my server instructs Cloudflare to throw away cached pages after three seconds. The mysterious “A3” means “expires after 3 seconds”. How did this instruction get there? It gets written by WP Super Cache. I checked WP Super Cache. I work on software performance, but I am not an expert on Web performance. However, this feels like a very short time-to-live. I am puzzled by this decisions by the authors of WP Super Cache. Posted on February 1, 2019 Author Daniel LemireCategories 6 Comments on Web caching: what is the right time-to-live for cached pages? My blog is relatively minor enterprise. It is strictly non-profit (no ad). I have been posting one or two blog posts a week for about fifteen years. I have been using the same provider in all this time (csoft.net). They charge me about $50 a month. I also subscribe to Cloudflare services, which costs me some extra money. I use wordpress. If I had to do things over, I would probably choose something else, but that is what I have today. I have thousands of posts, comments, pages, and lots of personalization: I’d rather not risk breaking or losing all this content. I use php version 7.0. My host provides version 7.3, but 7.0 is the latest they support with something called mbstring. Without mbstring (whatever that is), my blog simply won’t run. I estimate that I get somewhere between 30,000 and 50,000 unique visitors a month. Despite my efforts, my blog keeps on failing under the load. It becomes unavailable for hours. Several times a week, someone emails me to report that they tried to leave a comment and they got a 500 error. I seem to get about one spam comment per minute or so. I have just now decided to close comments on posts older than 30 days, in the hope that it will relax the load on my server. My error logs are filled with “End of script output before headersâ€ (a few every minutes). Header set Cache-Control "max-age=600, public"
The intention was that it would entice Cloudflare to cache everything. I do not think it worked. I setup a separate cron job to call wp-cron.php every hour. I have asked my host provider (csoft.net) to give me more memory, but they seem unwilling to do it transparently. Though csoft.net is neither cheap nor particularly modern, they have been professional.Â I have purchased a service with SiteGround, as I am considering moving there because it seems more popular than csoft. I am not super excited about tuning my PHP/Wordpress setup, however. I fear that it is wrong-headed optimization. What am I missing? How can I be in so much trouble in 2019 with such a relatively modest task? Note 1: I am aware that there are centralized platform like Medium. This blog is an independent blog on purpose. Note 2: Many people suggest that I move away from WordPress to something like static generation (e.g., Hugo). I am sympathetic to this point of view, but it is a much easier choice to make when you are starting out and don’t have thousands of articles to carry over. Credit: I am grateful to Travis Downs and Nathan Kurz for an email exchange regarding my problems. Update: My blog is now hosted with SiteGround.